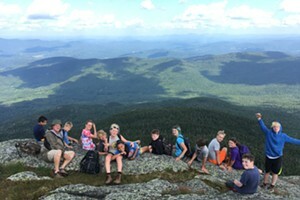 The Bee's Knees | Out to Eat | Kids VT - small people, big ideas! The first time she saw the menu at the Bee's Knees, my 8-year-old daughter started sobbing. "You mean they don't have chicken fingers here?" she asked, tears rolling down her cheeks. Nope, there's no sign of that particular kids-menu staple, which made me ecstatic. My son had already moved on. "Mom, I can get bacon in my mac and cheese!" he enthused. 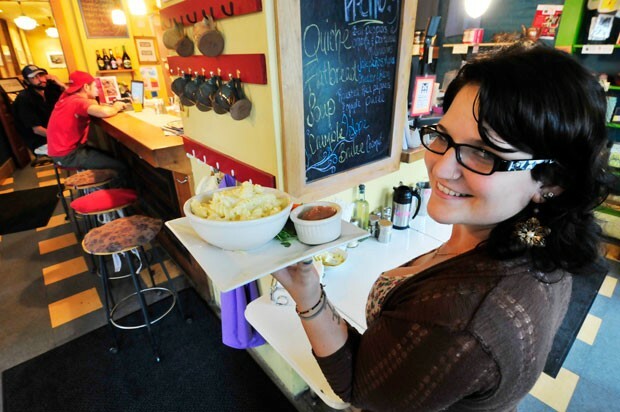 Devotion to home-cooked entrées loaded with locally sourced ingredients distinguishes the little eatery on Morrisville's Lower Main Street. The bread is made just down the road, at Elmore Mountain Bread. The eclectic menu offers Mexican and Asian dishes, vegetarian and vegan options, burgers and a daily flatbread. The five relatively healthy entrées on the kids menu are served with sides such as carrot sticks or housemade applesauce. The narrow dining room at the back of the restored brick building was about half full the night my husband and our twins came in for dinner — for a second time. The crowd in the front of the restaurant, which hosts café tables and a small bar, seemed more inclined to drinking and live music. But in a corner of the bar area, a bookcase of games, toys and books offered just the sort of distractions little diners require on a school night. Unfortunately, the pickings were slim. The Monopoly game we saw last time was gone, and the Uno deck was missing most of its cards. We placed our orders: pasta with spicy andouille sausage, quiche with scallions, kalamata olives and chard, a burger and fries, and a kids black bean and cheese quesadilla. Then we played short-decked Uno and waited for our meals. And waited, and waited. After 25 minutes I found an old Brain Quest deck, and we spent the next 25 minutes answering trivia questions, growing ever hungrier. It suddenly became clear to me what happened to the Monopoly board and Uno cards: Starving patrons ate them while waiting for their meals! We had a pretty good view into a kitchen that seemed understaffed and in no particular hurry to fill orders. When our food finally arrived after an hour, we fell on it like a pack of starving animals. All of our dishes were good, though none was great, and my enjoyment of the food was hampered by the slow service on a school night. But the long wait won't stop me from dining again at the Bee's Knees — a quirky, small-town restaurant with strong locavore values. Next time, we'll bring our own Uno deck. —"Out to Eat" is a monthly family-friendly restaurant review. Where should we eat next? Email us at ideas@kidsvt.com. Cindy Morgan is a freelance writer who recently moved with her family from California to Shelburne. Family-Friendly Amenities: high chairs, booster seats, books and toys, and a kid's menu with more healthy choices than fried fare. Our Bill for Four: $76.79, including tax and tip.